Cape Town International Convention Centre expansion will be good for Tourism! 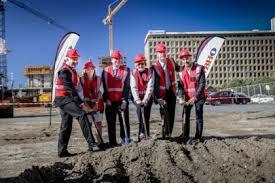 The sod has been turned for the construction for the expansion to the Cape Town International Convention Centre (CTICC), which is certain to boost the Tourism industry in Cape Town specifically, and the Western Cape economy generally. Green design elements have been planned, to make the expansion section environmentally sustainable. Western Cape Minister of Tourism Alan Winde said about the expansion: ‘The CTICC is a major economic catalyst and the planned expansion of the venue will significantly increase its capacity for meetings and exhibitions. This will boost business travel to the province and create more employment opportunities in the tourism sector. In the previous financial year, it is estimated that the CTICC created 7 500 jobs. This is an excellent example of infrastructure-led growth paving the way for increased employment for our residents’. The exhibition space will double by 10000 m², which means that Cape Town can bid for future Indabas, Africa’s largest tourism exhibition.